Panini America has been making fine use of the Team USA and Collegiate licenses. 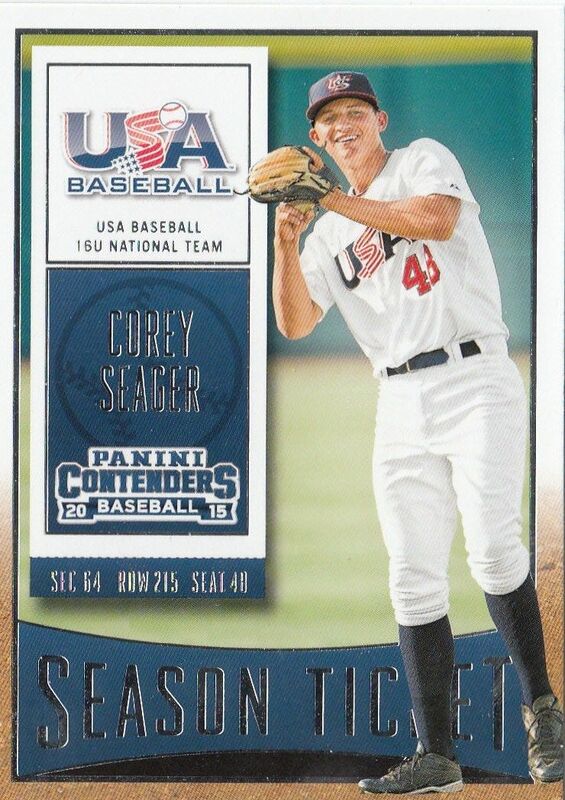 They recently put out their Stars & Stripes and Collegiate box sets, and now they have released their Contenders Baseball card set. 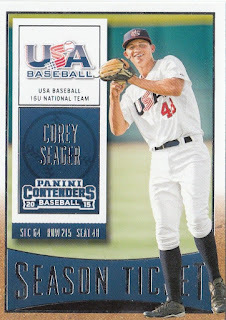 It features players (both old and new) in either their university or Team USA garb. Check out a complete checklist here. Several of the Dodgers' top prospects are featured; including Seager, Urias, Buehler and Pfeifer. Check out the base cards below. Of special note, former Dodger outfielder Frank Howard and hitting coach Mark McGwire are shown in their alumni uniforms. I'm hopeful that I correctly identified all the Dodger prospects in this set (since they only make mention of their college), but if I missed anyone please let me know. I should have pics of the Dodger inserts and autographed cards in the next few days. Do you know who this fellow is? Featured above is a vintage 1934 AP Press Photo taken during Spring Training of a 28-year old pitcher trying to make a career out of the game. His name is Phil Page, and he did make the Dodgers roster to start the season. Unfortunately, his stint was short. Page got into six games for Brooklyn, but yielded thirteen hits and seven runs in ten innings pitched out of the bullpen. He would never pitch in the Major Leagues again. What I love about the photo isn't the hopeful yet fearful stare of a young man still confident in his abilities, but knowing at the same time that he must make his mark is now. What I love is that fantastic Dodger uniform. It's a beaut. There are red stripes all around the Brooklyn name, collars and short-sleeves, and I imagine they provided a stunning accent to the jersey. I bet the Brooklyn name just "popped." It must have been a sight to see these. 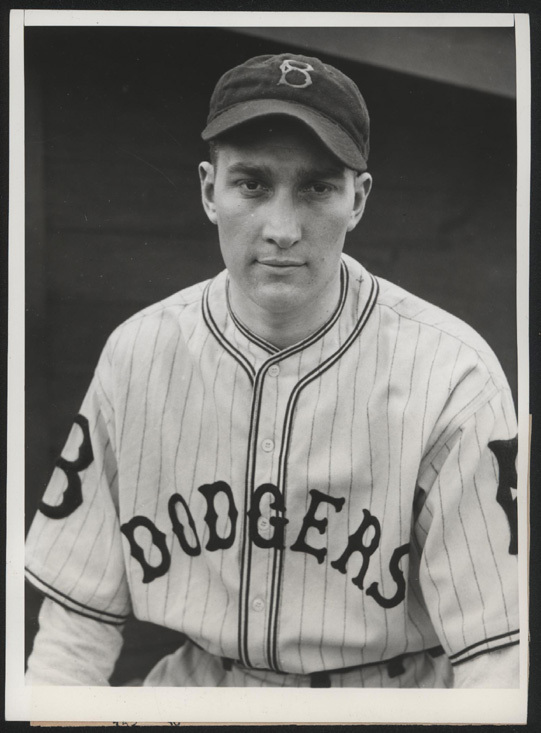 They didn't actually wear this pinstriped jersey until the following season - 1935. Apparently, they decided to debut it during their spring sessions in Florida in 1934. 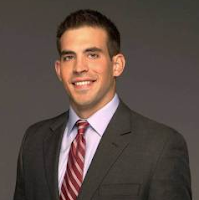 The Dodgers have added a new broadcaster to their roster - Joe Davis. You can follow Joe on twitter here: @Joe_Davis. Jon Weisman at Dodger insider pens a great biography on him here; including a video reel of some of his work with FoxSports. Per a Dodger press release. Davis, 27, is one of the most impressive young broadcasting talents on the national scene, having called Major League Baseball, college football and college basketball for FOX Sports. Davis will call 50 road television games on SportsNet LA with Orel Hershiser, Nomar Garciaparra and Alanna Rizzo next season. Davis will be joining Hall of Famer Vin Scully, who will return for his 67th season. Charley Steiner will handle the television play-by-play for the remaining road television games and when he isn’t doing television, Steiner will team with Rick Monday to handle the Dodgers’ radio broadcasts on AM 570 LA Sports Radio. BTW, Steve Dilbeck at the LA Times wonders aloud: "Did Dodgers just name Vin Scully's heir apparent with Joe Davis hire?" Talk about pressure, eh? I think it's best to say that this is more of a tryout for a guy who appears to be well regarded. Via Dylan Hernandez at the LA Times, "Justin Turner's knee surgery included microfracture procedure." David Hood at True Blue LA takes a look at, "Dodgers top 2016 prospects: No. 26-30." Via Make Gameday Everyday, "Changes in MLB attendance by team in 2015 vs. 2014." There is a nice graphic showing how attendance changed team by team. The #Dodgers are showing significant interest in free agent reliever Darren O'Day, according to an MLB source. Scott Andes at LA Dodger Talk puts together a nice review on who he is, here. Ha! Via Night Owl Cards, "What 868 Eric Karros cards from 1992 Upper Deck looks like." He tells us all about how he came to be in possession of the largest stash of Karros rookie cards in the world.